My pregnancy with Jude was one of the biggest surprises and greatest joys of my life. As a teenager and into my twenties, my body and I went through many battles together - mentally and physically. I faced a constant, quiet worry that I would never be able to have children. This is sometimes a worry even for people who have never had health problems! It’s funny, the month that Jude was conceived, Eric and I went on a road trip to see our friends and family in Tennessee. We were both consumed with thoughts of adding to our family, and we spent most of the 16 hour drive discussing when would be the best time to start. I was reaching the end of my first year of grad school at NYU and facing a demanding workload for the summer. We decided it would be best to wait until after I graduated. Two weeks later, I found out I was pregnant. I have learned a lot since then about the difference between God’s timing and my own, and I can only smile at how refreshing it is to know that plans don’t usually happen exactly the way I expect them to. On the morning of January 19th (my due date) I woke up and cooked myself an extravagant breakfast. When you are pregnant with your first baby, it is repeated to you over and over and over and over again that most first-time moms go past their due date and have long, hard labors. I’ve known about as many women that this is true for as I have women that it isn’t, so I don’t know why people are still so eager to share this “fact” to every pregnant person that they see. At any rate, with that in mind, I decided to treat my due date like an extra special day, but to keep myself open to whatever it would bring, baby or not. Back to my breakfast - it was amazing. Blueberry pancakes with nutella and marshmallows, turkey bacon, fresh raspberries and strawberries, orange juice, and the one sacred and holy cup of fully caffeinated coffee that I allowed myself every day. My house smelled amazing, Finn (our 70 lb yellow lab) was extra cuddly, and Eric had taken off work for the day so that he could accompany me to what I hoped would be my last weekly doctor’s appointments. After enjoying our leisurely breakfast, reading some birth stories from Ina May’s Guide to Childbirth for the thousandth time, doing yoga and meditating with Jude, we were on our way to our first appointment. At our first doctor’s appointment, I was not feeling any contractions, but was feeling very large and ready to hear that I was close to meeting my baby. Dr. S, my easy-going and fabulous midwife, informed me that I was four centimeters dilated, 80% effaced, and that she was touching Jude’s head. “Go for a walk when you get home, go for a walk in the morning, and I bet you will meet your baby this weekend,” she said. Out of the 5 doctors/midwives I was required to meet in the practice, she was my favorite, and I wanted desperately to go into labor the next day (Saturday) so that she would be the one there for my birth. There was only one doctor I didn’t really love - we’ll call her Dr. B, and I desperately did not want her to be there instead. Eric and I left our appointment ecstatic and starving. We treated ourselves to a huge salad (for him) and a giant spicy burrito (for me) from a local restaurant. We sat in the car before our next appointment, eating and laughing and imagining the possibility that we may actually meet Jude in the next few days. Our next appointment was with a perinatologist I saw every 6 weeks throughout my pregnancy, due to concerns from my sorted medical history. At this appointment, they told us that Jude weighed 6lbs, 13 oz, and that he was about 20 inches long. His lungs were strong, and upon looking at my cervix, this doctor said, “I would be highly surprised if you made it to Monday.” I excitedly texted my doula, Joyce. She told us to relax, enjoy our day, and see what happened. So, Eric and I went home, grabbed Finn, and went on a long walk around our neighborhood. We walked for what felt like hours, just talking about how amazing this pregnancy had been, how lucky we were, and how we couldn’t wait to finally kiss Jude’s face. Truly, we were quite high on the joy and excitement of it all. When we finally got back to our apartment, we spent some *ahem* alone time together as husband and wife (time we knew may not come again for a while! ), and immediately after I started feeling substantial rushes (contractions), each about 7 minutes apart. I took a shower and did some yoga, and was still feeling a strong rush about every 5-7 minutes, so we called Joyce and asked her to come over. I sat on the birthing ball, cuddled with Finn, and stretched as much as possible. Because I had tested positive a few weeks prior for GSB (Group B Strep - something most pregnant women are tested for between 35-37 weeks of pregnancy) I would need 2 rounds of IV antibiotics as soon as active labor started. Given this information, when the rushes got stronger, I decided to call my hospital and see what they said. When I finally got through to labor and delivery, they told me to come to the hospital, and then gave me the one piece of news I didn’t want to hear: Dr. B was the on-call doctor for the night. We packed up our car and headed to the hospital around 9 PM. 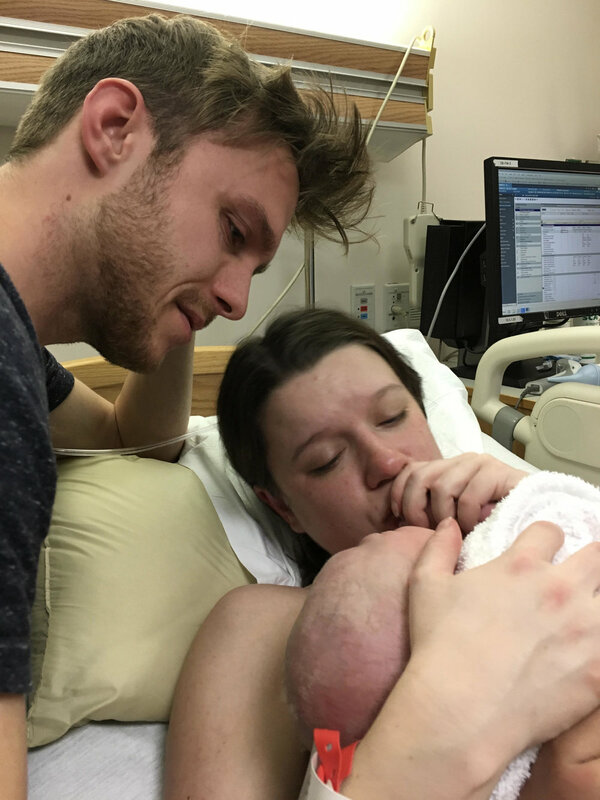 While waiting to be buzzed into the maternity ward, I said confidently into the speaker: “I’m Kelsi Kennedy, and I’m here to have a baby.” Half an hour later, my rushes had completely subsided, and a half-hour after that, they sent me home. In retrospect, I believe it was the knowledge that Dr. B was the doctor on call that caused me significant emotional stress and made my labor stop. Let me be clear - Dr. B was fine, we just hadn’t connected during my appointments, and I was determined that Dr. S would be the person who would deliver my baby. I was disappointed, tired, and definitely not in the mood to have a baby. On the way home from the hospital, I felt completely relaxed, and very tired. The whole drive was very serene, and Eric and I kept saying how we couldn’t wait to get home, have a good night’s sleep, and maybe meet Jude another day. As we pulled into the driveway, I felt a rush - the first one in a few hours. I dismissed it, knowing that I had felt rushes like it before that had gone away with a good nap or night’s sleep. Walking up to our door, I felt another that stopped me in my tracks. Stubborn and determined to get to bed, I ignored it again. As most women who have been through labor know, at a certain point, sometimes rational thinking can go straight out the window. I really thought I could will the rushes away and get a good eight hours of sleep. Ha! Refusing to brush my teeth, wash my face, or do anything that may cause any more activity in my uterus, I climbed into bed, pulled the covers up to my chin, and shut my eyes tight. “You’re not going to brush your teeth?” Eric asked. “Nuh-uh,” I mumbled, keeping my eyes clenched tight and curling up into the fetal position, willing myself to fall asleep. Eric was skeptical, but tired, so he accepted my answer and crawled into bed. He fell asleep immediately. Less than a minute later, I felt a rush so strong and intense that I jumped up with a catlike quickness onto all fours. I let out a low groan. This, however, was easier said than done. You see, I knew that I needed to go to the hospital, but getting myself out of the hot shower, into the freezing night and into the car, and sitting still in the car on the way to the hospital, was an entirely different matter. Thankfully, Eric had prepared himself for this very moment. He was perfectly balanced in his tenderness and strength. “You can do this,” I remember him saying, “and you have to get out of the shower so we can go to the hospital.” This is what I now know as a doula is called the “take charge routine.” Eric nailed it. He helped me get out of the shower, and as I had a rush every minute or less and was therefore unable to move. He dressed me, combed my hair, started the car, and helped me out the door. I moaned and squirmed in the car seat as I pretended not to notice that Eric was going well over the speed limit. He screeched into the ambulance bay, helped me into a wheelchair in the waiting room, and rushed back out to the car before our car was towed or hit by an incoming vehicle. Of course, there were papers to sign, and the fact that I completed this task without physically harming anyone or saying any curse words should be duly noted. "Would you like to wait for your husband to come back before we go up?" the sweet, precious nurse asked me as we headed to the elevator. "NO! NO NO NO!" I screamed, groaning loudly. At this point, I was gripping the wheelchair arms and squirming in the seat, causing a scene more fitting for a story about exorcism than one about the miraculous event of birth. Just as we were reaching the elevator, we turned to see Eric running in behind us, the birthing ball and no less than 4 bags in tow. There was one teenage girl and her mother sitting in the waiting room that night, and I hope that they still picture this in their minds and laugh. In her tenderest, warmest voice she said, “Oh no. Don’t be scared! Everything is okay," like the true hero every woman needs her doula to be. Shortly after she arrived, I got into the tub. Finally, I found my calm. I sat in the tub with my legs crossed, rocking, and I took charge of my body. Joyce held my hand and Eric quietly and gently gave me sips of water when I raised my head. I had read before that keeping a loose jaw and relaxed shoulders could help the cervix open. With each rush, I consciously relaxed my mouth and let my arms and shoulders drop. Through some rushes I would say, “Oooooopennn,” and others I would make deep, guttural sounds that sounded like someone else entirely. I was someone else entirely. As a laboring woman, I was planets away from the tub, the hospital room, the people around me. With my eyes closed, I was transported to the place where laboring women have gone for thousands of years - the internal stillness where intense pain makes sense in the greater scheme of creation. We stayed like this for an hour - me, Eric, and Joyce. The lights were dim, and from what I remember, no one spoke. I kept my head resting on my hands, my eyes closed, and tried to visualize Jude in my mind. I could feel the pressure of his head, and I knew I would meet him soon. As long as I stayed in that internal place and kept my body relaxed, the rushes seemed to be happening in a distant place, like waves carrying me to my goal. After the hour, the nurses asked me to get out so they could check my cervix. Looking back, I sometimes wish that I asked to stay in the tub, but I was ready to meet Jude, and I wanted to know how close I was. When they checked me, I was 10 centimeters and feeling ready to push, but my waters still hadn’t broken. I sat in the bathroom for a few minutes, praying and willing my water to break on its own. When it didn’t, I asked the nurses to get Dr. B. She broke my water, and within fifteen minutes, I was pushing. I pushed while on all fours, then lying on one side, then the other, until Jude's head crowned. For the final few pushes, I rolled over onto my back. Joyce if I wanted a mirror, and to my great regret I said, “no!” - not because I didn’t want to see, but because I was so focused on pushing and meeting my baby that I didn’t want anything to slow the process. I remember that Eric was so tired, but he looked completely amazed and awake as Jude’s head was about to be born. I remember that Jude felt like a tiny bundle of bones and jelly when they laid him on my chest, and it scared me because he felt so foreign and different from what I expected. Then, in a moment I will never forget, I saw his face, and his eyes immediately found mine. People still remark on the serious and thoughtful look Jude seems to always have in his beautiful blue eyes, and the day he was born was no different. The first time Jude looked at me, I felt that he already knew everything about me. “Hello baby,” I said, “we did it,” and kissed the palm of his hand. Our 6lb 11oz baby boy was born at 4:39 A.M. on January 20th after 4 hours of intense labor. He was born on inauguration day, but we always joke that since he was born before the event that he is “still an Obama baby.” His birth was the most awakening, exhilarating, and magnificent experience I have ever had, and the boy that came from it is pretty magnificent himself. Thank you for reading, and I would love to hear (or be present for!) your own birth stories.